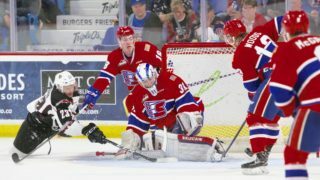 SPOKANE, Wash. — The Spokane Chiefs had their three-game winning streak snapped on Saturday night as they fell to the Calgary Hitmen, 5-1. Marc Kastelic scored a hat trick for the visiting Hitmen while Adam Beckman scored Spokane’s lone goal. 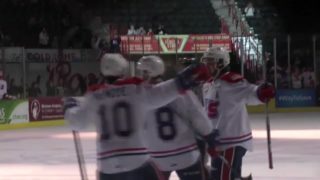 After a buzzing start for Spokane in the first period, it was Calgary’s Kastelic drawing blood first, scoring his 17th of the year on the power play off assists from Egor Zamula and James Malm. That same trio hooked up for Calgary’s second goal, again on the power play, just over five minutes into the second period as Kastelic found some open space near the left post, this time deflecting the puck off a Chiefs defenseman to beat goaltender Dawson Weatherill. Spokane got on the board to cut the lead in half at 17:15, scoring a power play of their own as rookie forward Jack Finley found Beckman with a perfect crossing feed from the left circle. Beckman one-timed his WHL rookie-leading 10th goal in to make it 2-1. That was as close as the Chiefs would get as Kastelic completed the hat trick with 24 seconds remaining in the middle frame, chipping in a rebound for his 19th of the season; tied for 2nd among all WHL goal scorers. Riley Stotts added insurance with two goals, including one empty netter, for Calgary in the third period. 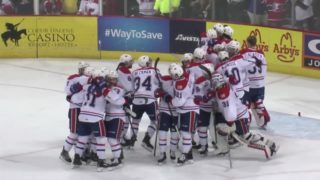 Spokane finished the game 1-for-2 on the power play and 0-for-2 on the penalty kill. Weatherill made 24 saves on 28 shots faced while Calgary’s Carl Stankowski turned aside 33 of 34 shots. 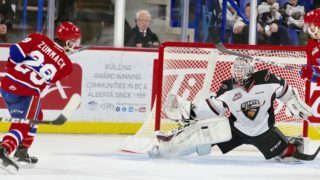 The Chiefs take on the Everett Silvertips in Everett tomorrow evening and return to the Arena ice Saturday, November 24 to take on the Kamloops Blazers. 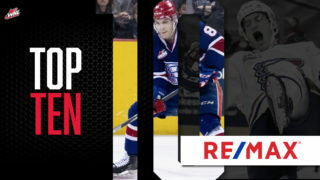 It will be Itron Poster Giveaway and Full-Team Post-Game Autographs Night, with the first 5,000 fans in attendance receiving a 2018-19 Spokane Chiefs team poster courtesy of Itron. Additionally, all fans in attendance are welcome to stick around after the game for a full-team autograph session. 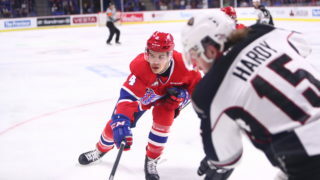 Tickets for Saturday and all Chiefs home games are available online here, over the phone at 509-535-PUCK and in-person at the Chiefs’ Ticket Office at Spokane Arena.